Youthfulness is not only a matter of a pleasant physical appearance, but also a reflection of a deeply positive state of mind. When beauty and high morale are jointly found, our chances at achieving success in life are multiplied. Laboratories GERnétic have developed this Crème Jeunesse with an intense biological power that the skin on your face (and hands) is sure to appreciate to the maximum. Enjoy revitalising, smoothing, softening and health-promoting benefits that will become everyone's envy. Youth Cream is a powerful cocktail of active nutrients with revitalizing and regenerative properties to combat ageing at the cellular level. Desoxyribonucleic acid from fish milt. Lipopeptide tyrosine-arginine associated to a polypeptide-glycopeptide compound with 15 amino acids. Amphiphilic b-lactoglobuline with lactic acid. One active compound that stimulates the activity of the Langerhans cells. Sea fennel, rich in vitamin C and minerals. One repairing enzyme from Thermus thermophilus, a bacterium that lives in the hot springs (75°C) found on the sea floor. Oil rich in gamma-linolenic acid. In the morning, apply a small amount to the whole face and neck. 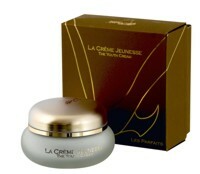 La Crème Jeunesse can be used by itself or in conjunction with Concentré Réparateur.